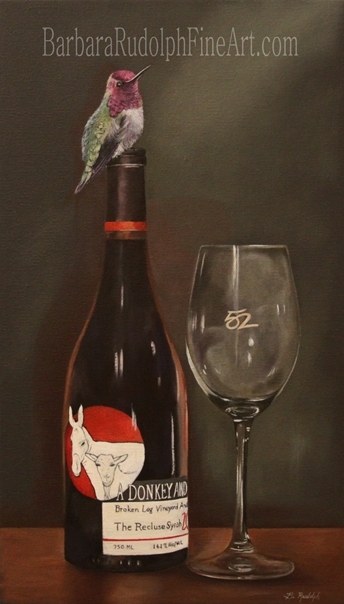 This oil painting of a "hummingbird" sitting on top of a wine bottle, was a recent commission. I painted it during my art show at the "Celebration of Fine Art." It was a birthday gift for a friend of the lady that commissioned it. They had all turned "52" this year, and the wine glass has the number "52" etched in it. The "Donkey and Goat" was also significant to some of their childhood memories, which is why this bottle of wine was selected for the painting. It was a fun painting, and although I haven't heard back yet, I sure hope the recipient enjoyed it. I am an artist that enjoys telling a story with my paintings. They are unique, thought provoking and often have a sense of humor to them. My most recent work has focused primarily on intimate portraits of birds, often in a peculiar and fun situation. I have devoted a lot of time to photographing birds which I later incorporate into my still-life arrangements of books and other objects with the birds. I enjoy the challenges of painting in a realistic style. I try to capture a moment in time with my sky paintings with a single bird or birds in flight. I am an Arizona artist that has been interested in drawing and painting since an early age. I have created many works for clients in a variety of styles, from floral to classical figurative paintings. My medium of choice is oil paint. Art is such an important part of my life. I love to spend time in the studio creating paintings that will bring joy into people's lives. "Bluebird" - Oil Painting & "How to mix those beautiful blues for your painting"